God has only one intention. He desires the salvation of all men. Through knowing Christ, man will come to know and love the Father. The modern world has a bitter need to see Christ in the streets. I am talking about the presence of Christ in Christians. Spontaneous and whole-hearted consecration is the flower of real love. For the moment, we may not be called upon to pour forth our sweat and blood on the battlefields of apostleship, but we can PRAY! Our prayers, penances and good works are a power. Our prayerful army of penitent souls whose supplications and sacrifices daily ascend to God is a great strength to the Mystical Body of Christ. Before God, prayer is more powerful than an arm of steel. The salvation of another man’s soul may depend upon me. God gave to every man the command of loving his neighbor. On Golgotha, Christ looked down on His little flock, composed of the three Marys and St. John. Please God, give me the courage to keep vigil with them at the foot of the Cross. Sanctifying Grace lifts man into the world of grace where the good he does and the evil he avoids, becomes infinitely meritorious. By prayer we become, with Christ, the co-saviors of our brothers, helping God in the great work of Redemption without ever taking from Him one mite of glory. Prayer is a kind of priesthood without its responsibility. Through prayer, there is no limit to the number of souls we can reach. We cannot say one prayer for someone in need without receiving from the Hand of God a shower of graces for ourselves. Prayer is all embracing! It puts its arms around the whole world and draws all men closer to God. Everyone who asks receives! Beneath the Cross, the Mother of God did what you do in the Morning Offering: She gave to God all that she had for the salvation of souls. Every sacrifice is an act of adoration and reparation. While the ritual of prayer is not the sacrifice, the offering of it is. In our prayer of adoration, we admit our dependence on God and God’s absolute rights over us. In the Morning Offering, we give our life over to God through the Immaculate Heart of Mary. Sin is the assertion of our independence of God which directly contradicts the fact of our creature-hood. Every sin is a denial of adoration of God. Through the Morning Offering, we give to God the Lamb who was slain on the Cross. It is an act of adoration and contrition. Uniting our prayers, works, joys and sufferings with all the Holy Masses being offered in the whole world and all those participating in them, is a powerful act of adoration, reparation and love. Because of the living union we enjoy with one another and with Christ, we are able to do by the omnipotence of prayer some of the things which God does on the strength of His perfection. The wounded Heart of Mary at the foot of the Cross beckons all who look at her to ponder the focus of her love, and its complete devotedness to the Heart of God. It does not say, Love Me; it says, Love Him! Mary and the Son of God surrender themselves to one another completely. By His Passion, the Word of God, made man, fathered the new mankind. By her compassion, by her close physical and spiritual union with the Crucified, Mary, as Mother, brought forth the new mankind. Mary is the Mediatrix of all Graces. On the occasion of the Jubilee at Fatima, Pius XII consecrated the world to the Immaculate Heart of Mary. On December 8, he solemnly renewed the consecration in the Basilica of St. Peter, at Rome. The consecration is the prayer of the Pope to Mary Immaculate. In it, he asks that our Mother grant to us many things. He does not ask for them as an outright gift, something she might obtain for us with no effort on our part, as one might ask for a miracle. NO! The prayer is a dedication, a consecration! The peace for which the Father of Christendom asks is the victory to which the Vicar of Christ will lead his people after they have fought for it and merited the grace of it. The consecration is the knight’s vigil on the eve of battle. He comes to Mary’s altar because the morrow’s battle will be in her honor and for the Kingdom of her Son. The Son through the Mother, the Mediatrix of All Graces, will give strength to the warrior’s right arm. But the man will wield the sword, not some angel. When there are enough right arms, strong in grace, the Mystical Body will be an irresistible fighting unit, spiritually armed and operating as one, able to overcome all those forces in the world that the devil can muster against it. What does Our Lady ask all those consecrated to Her Immaculate Heart to do? Daily make the Morning Offering, pray the Rosary, confess and receive Holy Communion on First Saturday in reparation, and offer up the sacrifice of Daily Duty for the salvation of poor sinners. The Mystical Body needs health to grow and defend itself. We speed the establishment of the Kingdom of God on earth by devoting ourselves to the Immaculate Heart of Mary. Mother and Son have always carried on the labor of Redemption together. Each morning, dedicate your day to Jesus through Mary. Make faithfully and fervently your Morning Offering. It is the most Important ACT of your day! We cannot separate the apostleship of prayer from the apostleship of suffering for, by it, we offer to God our prayers, works and sufferings through the Immaculate Heart of Mary. Our physical sufferings are nothing compared to the sufferings of our soul. Stand on any street comer, and look at the many sad faces, furrowed by worry and fear, masking the dark labyrinths of the mind where the soul wrestles with anxiety, loneliness, hurt, ingratitude and sorrow. When the Messiah came to us, He came as the Man of Sorrows. Because we are incorporated in Christ, none of man’s problems can be solved on the basis of individualism. No man is a being unto himself. He is everlastingly a part of the Body of Christ, who was the priest of His own sacrifice. Through suffering, we will have in our own body a Relic of the True Cross! The passion was everything that Divine Justice would demand from a sinful world as the price of those heavenly graces which would flood it and wash it clean. The work of pain is finished for Christ the Head. But His members still must suffer. The more we detest sin, the greater will be our efforts to destroy it – the better will be our prayer! This is the mission of the Church and each one of us who love Jesus has an intimate part in it. Never fail to plunge into the Ocean of Grace offered to us, each day, through the Morning Offering. In doing this, we will with one voice, one heart and one soul, greatly hasten the Triumph of the Immaculate Heart of Mary. 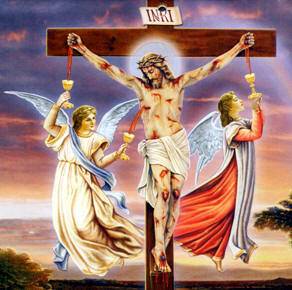 O MY GOD, in union with the Immaculate Heart of Mary, I offer Thee the Precious Blood of Jesus from all the Altars throughout the world, joining with It the offering of my every thought, word and action of this day. I desire to gain every indulgence and merit I can, offering them, together with myself, to Mary Immaculate whom Thou hast appointed the dispenser of the merits of Thy Precious Blood, especially by means of this Scapular (here kiss your Brown Scapular) that She may best apply them to the interests of Thy Most Sacred Heart. Amen. When we come to know Our Lord’s gentleness, we will begin to understand the true meaning of suffering. People will go to great means to escape suffering. The devil inflates the horror of suffering so that it becomes bigger than life, a thing most dreaded and something to be avoided at all costs. No one can escape suffering. Rich and poor, healthy and infirm, the good and the bad, all suffer. When our suffering is united with the suffering of Christ, we begin to find the hidden treasure which it contains. In His great goodness and mercy, Jesus allows us to participate in His redeeming action in the world: God respects man’s free will and does not force us to choose Him or love Him. Our Lady of Fatima was so sad when She spoke to the children of the real number of souls who go to Hell because there is no one to pray for them and make reparation. The grace of salvation for many a soul in their final moment depends on our prayer for them. Our weakness, sinfulness and attachments can make us afraid to go to God. We are tempted to think He cannot love us. This is a lie. His merciful Heart is most attracted to weak and sinful souls. He raises them up if only they will let Him. One thing is necessary, that the sinner set ajar the door of his heart, be it ever so little, to let in the rays of God’s merciful Grace. God will do the rest. This entry was posted on Wednesday, February 20th, 2013 at 4:21 pm and is filed under NewsFlash, Saint Philomena. You can follow any responses to this entry through the RSS 2.0 feed. Both comments and pings are currently closed.